This was a first class performance by the Australian team this year. They won more medals than ever before with a greatly improved performance by the girls. In fact they won every race they were in on the first day, won the point score award for lightweights and women and finished third overall. 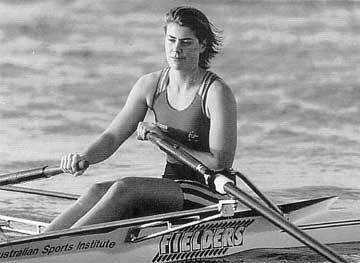 Sally Newmarch won the first gold medal by any Australian woman at this regatta. The coach Nick Garratt had a big job with this crew in a short time frame. The crew itself applied themselves determinably to the task preparing for this event, especially in a quad. Unfortunately, there was a bit of sickness in the crew the week before which also did not help matters. However, no one could doubt the application of this crew and it was great when they won their heat. If perhaps they rowed the final that way they may have been closer to the medals. The Australians were in fifth placing throughout the race. It was a very controlled race.This crew didn't get the start that it was looking for and then had to use the race to catch up with the leaders. They were fourth after the first 500 and were third with 500 to go. However, the gap was too much to the first placed crew and they finished a strong second. After winning their heat well against good opposition we were looking forward to a medal with this crew. Noel Donaldson had worked well with the crew and was looking forward to a real determined effort in the final. They always seemed to have a bit of a problem with the second 500 and this was the case again in the final. They slipped to fourth at the 1,000 metre mark and did not recover. However both Australia and Canada nearly caught the leaders. The race was of a high standard, the winning time 5.34.2 by Germany. This was a great race and Hamish gave everything to try and win it. Michal Vabrowsek from the Czech Republic is also a top sculler and he wore Hamish down over the race to win by 1.9 seconds. Hamish led well early and maintained his lead up to the 1,000 metre mark. The Czech rowed a faster third 500 by some 2.4 seconds and gained the upper hand. The race was fought out to the finish and was a credit to Hamish. The next day Hamish came down with a virus which may have affected him during racing. This crew started a bit slowly and fought to get second position by the 1,000 metre mark. Unfortunately, the Italians who had the lead from the start maintained their lead and continued to row strongly for the remainder of the race. Glen and Karl tried hard to the finish and although perhaps a little disappointed did very well to win silver. Glen Loftus was one of our most successful Senior B rower, having a gold and silver in two years. The pressure was on this crew to repeat the gold medal of last year. They gave it a real go missing gold by only 00.02 seconds. This crew rowed in the same Stampfli boat as last years crew and took a while to settle down initially. However, with further training the crew settled down well and started to perform. They were always within range of the leading crew, France, throughout the race and came home very strongly just to miss out on the line. It took 45 minutes to get a result. This boat has now won Silver, Gold and Silver in the last three years. After the Luzern regatta, the result of which she wasn't impressed with, she became very focused and determined to win at the Nations Cup. Sally won her heat by four seconds and raced the semi final intelligently to finish with ample to spare. Sally Newmarch led throughout the race and was only really challenged in the last part of the race. She did it so well leading by over a length in the first 500 metres. The Australians had an all the way win. It was a good and fast first 500 metres taking a 0.9 second lead. The second was also good pushing out the lead to 1.70 seconds and the third 500 metres was a blinder taking the lead taken out to 2.40 seconds. The field came back to the Australians over the closing stages but were unable to catch the Australians who finished 1.50 seconds in front of second. This crew was very determined to do well as this was Jo Lips last year in Senior B. Jo and Kisahn are great friends and consequently they work well together. This crew led from the start and still had the lead at the 1,000 metre mark. However they could not maintain that pace throughout the race and the field came back to them in the third 500 metres leaving them in second placing behind the Spanish crew. In the closing stages the Germans also passed them in a race with the Spanish crew leaving the Australians with the bronze.